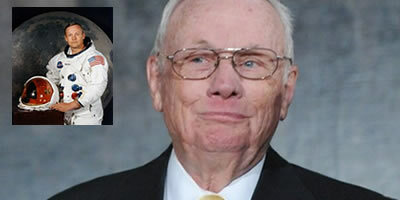 Conspiracy theories bombarded the internet over the "untimely" death of Neil Armstrong, 82, who was "supposedly" the first man to walk on the moon. "Not buying it," wrote Smarterthanthat87 on a PrisonPlanet.com forum. "He was about to spill the beans so they shut him up, permenantly." While theories vary, most agree Armstrong was assasinated to continue covering up a fake moon landing just 43 years later. "He couldn't live burrying the truth, and the Powers That Be couldn't live with him baring it," wrote CynicalPuppy. Many pontificate on other intelligence Armstrong may have been on the verge of leaking, including, but not limited to, Area 51, President Obama's birth certificate, the 9/11 Truther movement, and the assasinations of Elvis Presley, John F. Kennedy, Robert Kennedy and Martin Luther King, Jr.
"They knew 44 years was too long to stay silent," wrote Smarterthanthat87.